Dehradun is a long way gone from Ruskin Bond's excerpts. Forest Research Institute FRI, Dehradun stands as a bastion of solace in the cacophony of car horns. The FRI has much to offer, yet it lacks a proper sunset vista. It was the librarian at FRI who suggested that we visit the Santala Devi Temple for a good sunset view. Santala Devi temple is located near Jhariwala village, a 10 kilometre (30 minute) drive from the FRI (view route). The easiest way to approach the temple is by your own vehicle. Public transport means catching a bus till Birpur and a short 4-kilometre jeep ride till Jhariwala. There is no avoiding the Pandava storyline temples in Uttarakhand. Yet, the legend of Santala Devi Temple celebrates non-violence and its history has nothing to do with the omnipresent Pandavas. Saturday marks the transformation of the Goddess into stone. Thus avoid the temple on Saturday and Sunday as the sunset viewpoint is often crowded. Despite some stellar work by Indian Army's Eco Territorial Army, this temple has to put up with thousands of littering 'pilgrims' and 'tourists' every week. So you will often find litter cluttering the trail and the temple complex. Indian Army's first Ecological Task Force (also known as Ecological Battalion) was set up in 1982, after Indira Gandhi received inputs that the problem of unemployment among retired Jawans and of the need to check deforestation and soil erosion could be solved with a single stroke. 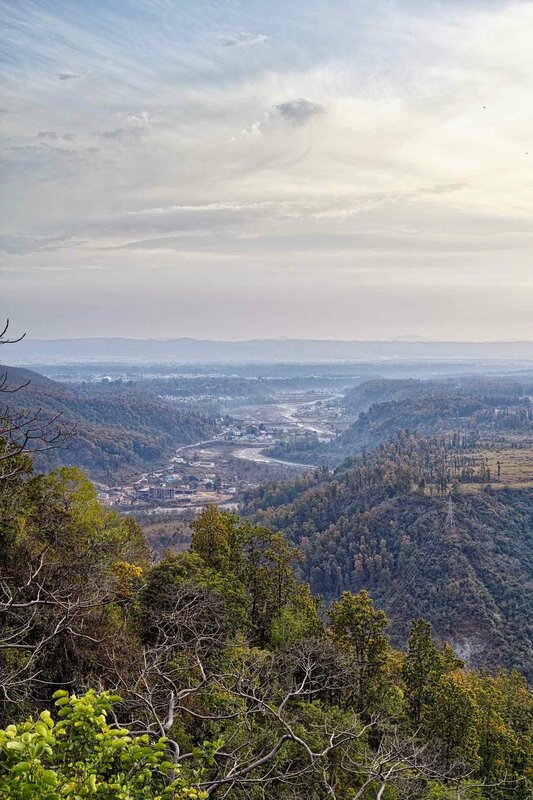 The 127 Infantry Battalion was put to task on the Shivalik hills around Mussoorie, where rampant mining had caused severe damage to the local ecosystem. Read more about Indian Army's Ecological task Force at UNFAO and Viewspaper. Sunset at Santala Devi Temple. Nun river in the foreground and a couple of villages on the tabletop mountain. Yet, we were not there for a religious pilgrimage. The temple lies on a small knoll that overlooks the Nun river and peeks over the tabletop village of Birabari. Behind the temple are a few benches and a two story viewpoint that has some impressive sunset views. The trail from Jhariwala is an easy 1.3-kilometre walk over wide concrete steps and packed mud. A couple of smaller temples and a well dot the way. The trail is child-friendly with a gentle 200-metre ascent and there are no steep drops or tricky sections along the way. We reckon any kid over the age of four should be able to complete this walk.